Turnbuckles are not intended for lifting as they are designed to take up slack and apply tension for support or suspension, or to adjust the length of rope, cable, or tie rods. They consist of a metal frame called a body that is tapped with a left-hand thread on one end, and a right-hand thread on the other. Two end fittings (studs, eyes, hooks, or jaws or a combination of any two of these) are screwed into either end and attached to workpieces on either end before the body is rotated (turned) and both end fittings are drawn into the body simultaneously to apply tension. 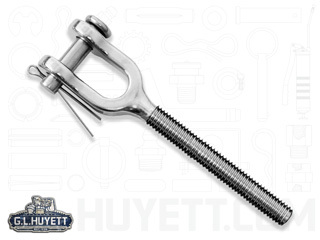 Turnbuckle Jaw Ends are available with either left handed or right handed threads, one of each is needed to complete the turnbuckle assembly. Jaw Ends feature a yoke or clevis like end that allows for quick installation and removal of cables, wire, or rope with either a bolt pin or clevis pins/cotter pin assembly.